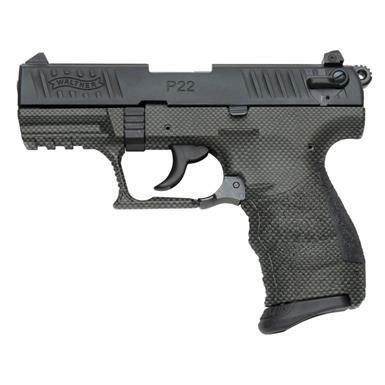 Walther® P22® Talo Special Edition Semi-automatic .22LR Handgun. Topnotch Walther® quality. Whether for personal defense, target shooting or plinking at the cabin, you'll appreciate the easy handling, light weight and smooth-shooting performance of this Walther P22® Talo Special Edition Semi-automatic Handgun. It's chambered in .22LR for shooting fun and less recoil, while the ergonomic polymer grip fits comfortably in your hand for excellent control. Plus, it comes standard with a lower rail for easy customization with aftermarket lights or lasers.